Castel San Pietro Terme, a town with a strong spa-resort tradition, lies at the feet of green hills surrounding Bologna on the border between Emilia and Romagna. In 2005 the city gained the certification "Cittaslow", introducing Castel San Pietro Terme to the "International Network of City of Good Living". The city is renowned for its high quality of life and the many services available to citizens and visitors. Visitors porperly confirm that in Castel San Pietro Terme life is better than elsewhere. The opinion is expressed by tourists coming to town to visit the spa, play golf, ride a mountain bike or stroll and sunbathe in the green park along Sillaro. Above the signs of the original Roman and medieval plant, the old town has a 16th-18th century aspect, characterized by the traditional porticoes that reminds Bologna. The symbol of the city is the keep (Il Cassero), built in 1199, year of foundation of the town, which houses a recently renovated theater. Among the most interesting monuments there is the Sanctuary of the Crucified, in the main square, and the adjoining tower that houses a concert of 55 bells, unique in Europe. 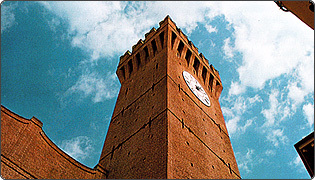 from Bologna and Rimini/Ravenna: taka A14 motorway, exit at Castel San Pietro Terme. from Firenze: from motorway A1 take motorway A14 towards Padova/Ancona/Bologna Centro/Bologna Casalecchio and exit at Castel San Pietro Terme. Line Bologna-Ancona-Rimini: Castel San Pietro Terme stop. Mercatino dell'Antiquariato: Castrum Antiquarium, last sunday of every month. Mercatino del Contadino: Centro Commerciale Bertella, Friday afternoons. Carnevale sotto i Portici della Cittaslow: Floats and tasting of local products, february - march. Cassero Jazz Festival: middle March. Very Slow Italy: Cittaslow spring festival, end March - beginning of april. Naturalmiele: Honey Fair and Trade, every saturday in June. Notte dell'Amicizia delle Cittaslow: wine, food and culture festival, last satudray in June. Settembre Castellano: wine, food and culture festival, September. Sagra della Braciola di Castrato: Mutton chop festival, 2nd sunday of September. Carrera Autopodistica: Hand-push vehicles race, 2nd sunday of September. Fiera e Borsa Nazionale del Miele: Honey Fair and trade, 3rd sunday of Spetember. CastelaNadel: Christmas streets markets, December - January.